With IRI version 1.5.2, how does the prevention of lazy tip selection change the tangle's partition tolerance? One of the features of IOTA is that sub-tangles can be constructed and then attached to to the main tangle in the future. Blockchain-based currencies are unable to survive long-sustained partitioning of the network because this may lead to reversal of a large number of transactions. It is also impossible to initiate an intentional partitioning in cases when it is required. 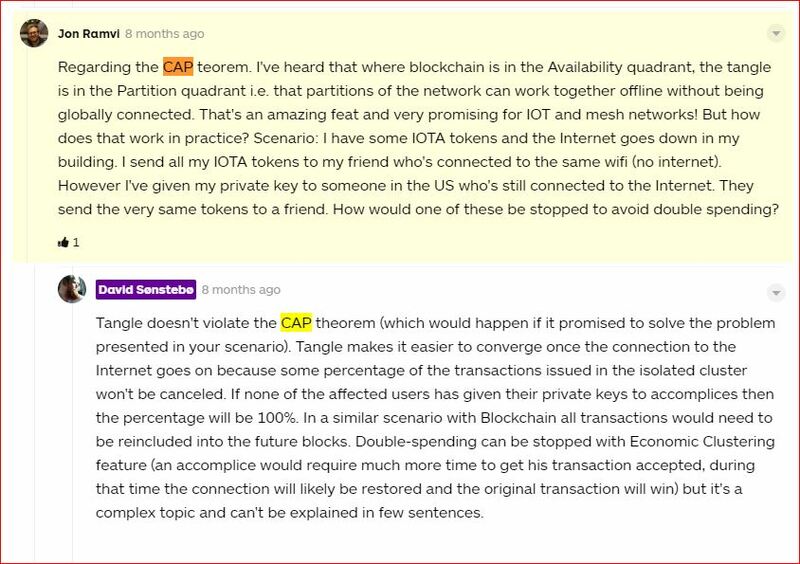 When would it be required to intentionally partition the Iota transaction graph? A @medium article on it called Sharding the IOTA Tangle Effectively. IMO, a distinction should be made between different partitioning scenario. It's the situation where a portion of the network is temporary disconnected for a relatively short period of time. Participant can still submit transactions to the disconnected tangle and when the disconnected tangle is back online, transactions will simply be included in the main tangle. This is economic clustering . The details are still unknown at the moment. An actor use a customized tip selection algorithm to build a side chain and try to include it in the main tangle later. We saw that this massive sudden appearance of transactions build on top of a very old milestone was causing problems for all participants using a fair-tip-sel. IRI 1.5.2 should fix this kind situation. Not the answer you're looking for? Browse other questions tagged tangle subtangles or ask your own question. How does a reattached transaction impact the tangle? How does a device get automatically the receive address from another device to send data to it? Why are Oyster Pearl's transactions clumping like this, and not getting confirmed? Is this an issue with the tip selection algo? “The Tangle” white paper: How the probability of double-spending event end with this approximation (t_0 μ)/w_1?